A Guide to City Running: How to Train for Your First 5K | Mega Mace, Inc. : Mega Mace, Inc. Many people dream of running a race someday, but feel overwhelmed and uncertain about how to get there. 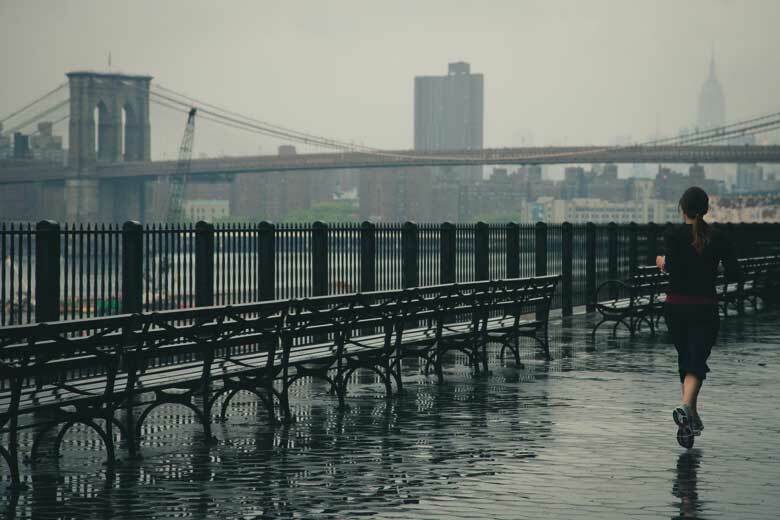 If you live in an urban area like a big, bustling city, it might be difficult to find places to safely train for a big race. Safe training is especially important so that you can train your body, prevent injuries, and ensure you’re not putting yourself in harm’s way. Can I let you in on a little secret? Runners have very different ideas about what constitutes the “perfect” pair of shoes for race day. Finding the right pair of shoes will come down to personal preference, comfort, and support. Consider whether you’ll need additional support for your ankles or arches. A specialized running store can examine your gait and determine if you pronate or supinate. These experts will also be able to make personalized recommendations to help you prevent any potential injuries. Never underestimate the importance of proper hydration – especially as a runner. Even if your race offers you bottles of water, it’s always best to bring some water with you as well. This is particularly important on longer runs where you might not have frequent access to drinking water. Rather than thinking you’re immune to potential injuries, it’s better to be prepared. Keep an eye out for any signs of overuse injuries, and see a doctor at once if you suspect one. Do you enjoy doing sun salutations at your favorite weekly yoga studio? If so, here’s some great news: yoga is very beneficial to runners. Yoga gently stretches your muscles and encourages joint mobility, all of which are helpful in keeping your body safe while you are running. Keep up with your daily or weekly yoga practice while training, and your body will thank you for it. When it comes to training for a race, you’ll want to take extra precautions to avoid making yourself a target. Therefore, it’s important to find the safest, pedestrian-friendly location(s) for running in your city. Start by checking your city’s walkscore. Try to avoid running in back alleys, near busy intersections, in places such as golf courses that have busy events, or anywhere else that cars, stray dogs, and attackers might pose a potential threat. Even if your city has a high crime rate, it doesn’t have to stop you from enjoying your healthy running routine. If you’re concerned about safety, you can bring along a friend or join a running club. If you prefer to train alone, let a friend or family member know where you are running and when you expect to return home. If you aren’t back around the designated time, it can serve as an alert to them that you are in need of help. As you can see, it’s never too late to start picking up better habits and training to run races. This hobby could make a positive impact on your mental, physical and emotional well-being. The tips listed above can be beneficial regardless of where you live. Hopefully, you feel empowered to train safely so you can run your very first 5K.